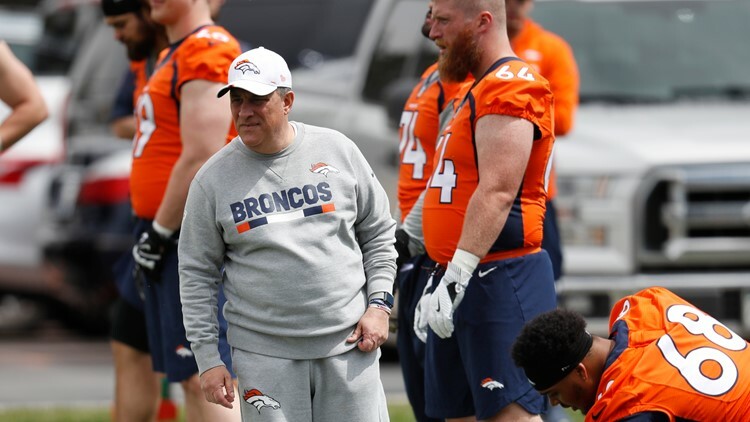 ENGLEWOOD – There was a brighter, cleaner look to Vic Fangio’s first practice as head coach. It’s not Fangio’s gray sweats, top and bottom, we’re talking about. It’s the players’ jerseys. They weren’t practicing in practice jerseys. They were practicing in game jerseys. “The whole reason we do that is to cut down on the grabbing," said Fangio, a head coach at 60 for the first time in his life. “When you wear the loose shirts, it’s very easy—almost unavoidable—for the players to grab each other when they’re going against each other. Whether it be wide outs, DBs, the interior linemen, it’s just so easy to grab those loose jerseys. It’s not easy to grab in-game because they’re tight. So we want to make it game-like as much as we can. That’s why we practice with them." Interior offensive line may be a need after the Broncos lost center Matt Paradis and guard Billy Turner to free agency while veteran Ron Leary is recovering from Achilles surgery. But maybe not a crying need. During the offseason, young Sam Jones and the experienced Don Barclay will get good looks on the flanks of center Connor McGovern. Jones, a sixth-round draft pick last year out of Arizona State and Highlands Ranch, mostly redshirted as a rookie last season although he did appear in five games. Among the fine Bronco blockers over the years who played little or not at all as rookies: Tom Nalen, Chris Kuper, Paradis, Ryan Harris, Paul Howard, Ken Lanier, Bill Bryan, Chris Clark and Keith Bishop. Then there’s Barclay who played a lot for Green Bay early – starting 18 games at right tackle in his first two seasons of 2012-13 – then moving into a reserve role the next four seasons, mostly as a guard. He was among the Saints’ final cuts heading into last season and didn’t catch on with a team. He’s trying to get back in with the Broncos now. Fangio says he hasn't settled on his starting interior blocking spots. “We’re a long way from determining that,'' he said. Fangio downplayed the absence of veteran cornerback Chris Harris Jr., who has yet to show up for the team’s offseason program. Harris wants his contract re-worked. “It’s just part of the NFL landscape," Fangio said. “It seems to happen a little bit each year." “It’s funny. I figured it would take a week or so before it wasn’t so awkward finding a seat in the cafeteria and things like that. You kind of take that that for granted being so easy. All of a sudden you’re the new guy and you have to just sit down with somebody and dive right in. “There is an aspect of it that is kind of fun. It’s not like I’m a young guy going through that, so it is a little bit different than back when you were a rookie. It’s still something you get used to. I think you have to dive right in and make yourself as comfortable as possible. I’m still getting there, but you can tell the guys are being great the whole time."